I've made some progress on stitching into the eco-dyed silk which I created with leaves etc found at the foot of Mount Fuji. 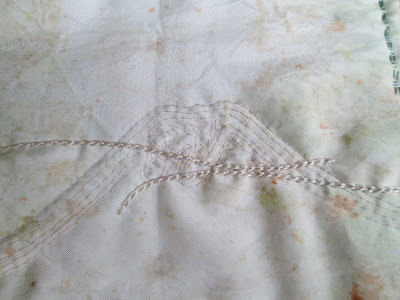 I am keeping the stitches limited, mainly straight and back stitch. Meanwhile the second type of bargain tulip has come into flower as the first ones are dying down. love the last Mt. 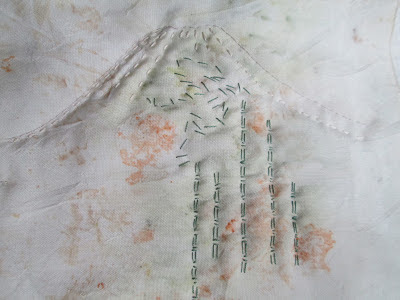 Fuji and the vertical green stitching, almost looks like caligraphy.. Hope along with the stitching the healing is progressing. You have used good simple stitches for Fuji-san, the perfect choice. I think by now you know that Mt Fuji will be added to UNESCO's list of World Heritage sites. http://www.bbc.co.uk/news/world-asia-22363161 Everyone here is so proud, but the mountain seems unruffled. Smart tulips to take turns in blossoming.